Be the first to share your favorite memory, photo or story of Darlaine. This memorial page is dedicated for family, friends and future generations to celebrate the life of their loved one. Our beautiful and caring mother, grandmother and great-grandmother, Darlaine Ellen Hart, died today (March 27, 2019) at the age of 99 in Louisville, KY with her daughter, Sonia, and son-in-law, Steve, near her. She was born October 18, 1919, in Pierpont, South Dakota, to Christian and Emily Reitan. She is pre-deceased by her spouse, Bob, her son, Terry, as well as her parents and one brother, Raily. Still alive to cherish her memory are her children, DeAnne Hart-Winn (Tom), TX, Sonia Hart-Yevich (Steve), KY, and Greg Hart (Marcia), NC; 8 grandchildren: Laura (Brad), Tom (Kevin), Robert (Angel), Chris (Robyn), Ben (Carol), Jake (Maggie), Steven M, and Inia (Justin), 16 great-grandchildren and many nieces, nephews, and friends throughout the US. 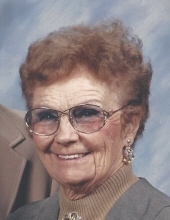 Darlaine was a secretary for many years, then a real estate agent with her husband, Bob, in Phoenix, AZ. Darlaine and Bob were married 69 years before Bob died in 2010. They enjoyed 32 years together in Phoenix with many of their friends and family members. Darlaine loved to dance and performed many times at Palm Lake Village talent show and several retirement communities dancing with Bob or dancing while Bob sang. Darlaine loved to entertain family and friends in the Hart home. She enjoyed people and sought them out to talk with them about their “day and their family”. Darlaine had a great faith. Interment will be at a later date in Phoenix Veterans cemetery next to Bob. To send flowers or a remembrance gift to the family of Darlaine Ellen Hart, please visit our Tribute Store. "Email Address" would like to share the life celebration of Darlaine Ellen Hart. Click on the "link" to go to share a favorite memory or leave a condolence message for the family.